Add height and impact in your garden. Tailor-made for a combination of central feature plant surrounded by bold summer bedding/trailiers/foliage. Perfect in a pair to frame doorways, gateways or line pathways. Supplied as a pair, in two sections - base and top, with a pack of screws to fix together very simply - stands 56cm tall, and 40 cm wide. 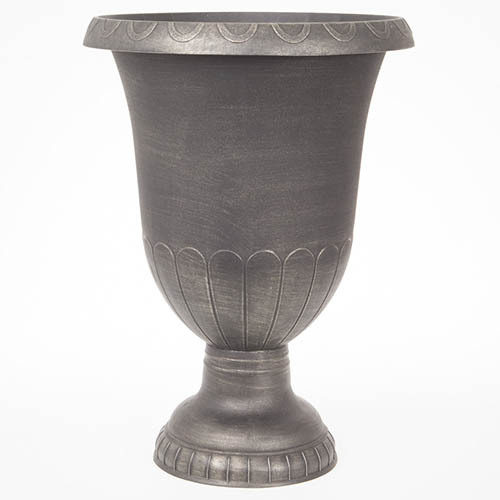 A wonderful way to add height and impact in your garden, this classic shaped garden urn emulates the style and design of Victorian gardens, at a fraction of the cost. Standing over 56cm tall, they are tailor-made for a combination of central feature plant such as a cordyline, golden cypress or similar with height, surrounded by bold summer bedding and perhaps some trailing ivies or foliage plants. Supplied as a pair, in two sections - base and top, with a pack of screws to fix together very simply, Stands 56cm tall, and 40 cm wide.